UPDATE: We’ve added Allan Kingdom to the bill. Check out the new lineup above. 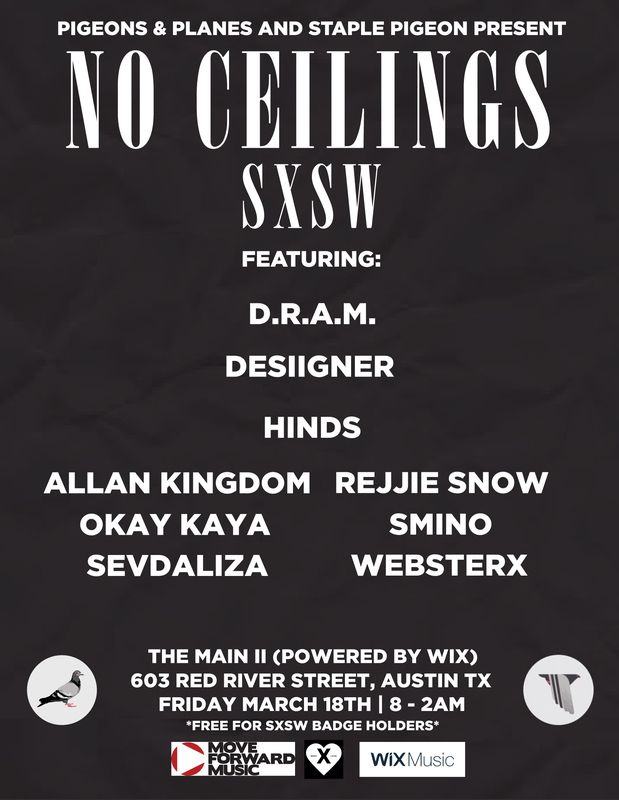 We’re heading back to Austin for a SXSW 2016 edition of our No Ceilings show series, and we’ve put together an incredible international lineup, headlined by D.R.A.M., who has been killing it ever since the viral success of “Cha Cha.” Also from the US, Desiigner, Smino, and WebsterX represent how much variety there is in rap right now while Section Boyz are coming with that gritty London sound and Rejjie Snow puts on for Ireland. We’ve also got Spanish four-piece Hinds, who will bring their sunny garage rock sound to No Ceilings SXSW alongside Iranian-born, Netherlands-based experimental pop artist Sevdaliza and New York-based Norwegian rising star OKAY-KAYA. No Ceilings SXSW goes down on Friday, March 18 from 8 p.m. at The Main II (Powered by Wix), 603 Red River Street, Austin, TX. It is free for SXSW badge holders.